What do superheroes do when they’re not saving the planet? A lot of the same things everyone else does—they prattle around the house, do their best to get along and sometimes get on each other’s nerves. Crammed into a back of a tiny VW Beetle, the hulking Winter Soldier (Sebastian Stan) has a request of Falcon (Anthony Mackie). “Could you move your seat up?” Like a grumpy sibling on a family road trip that’s already over-stretched his patience, Falcon isn’t exactly in an agreeable mood. “No!” he snaps. 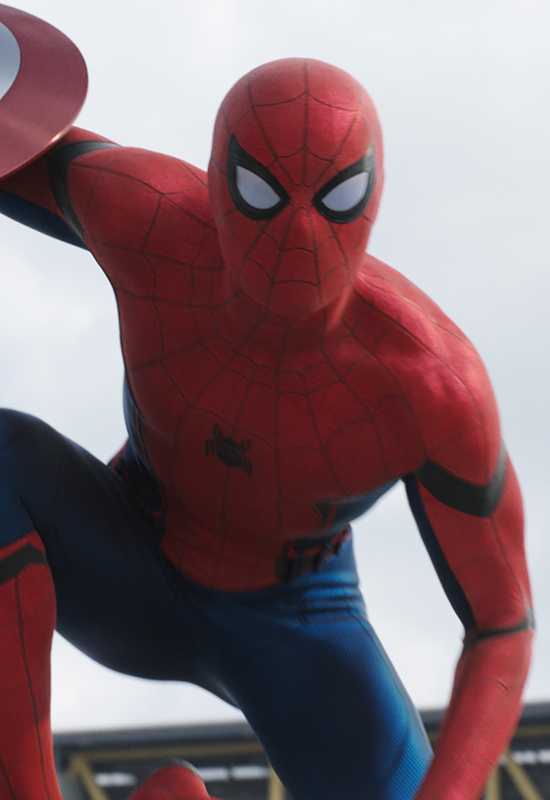 Spider-Man (Tom Holland) gets in on the action. 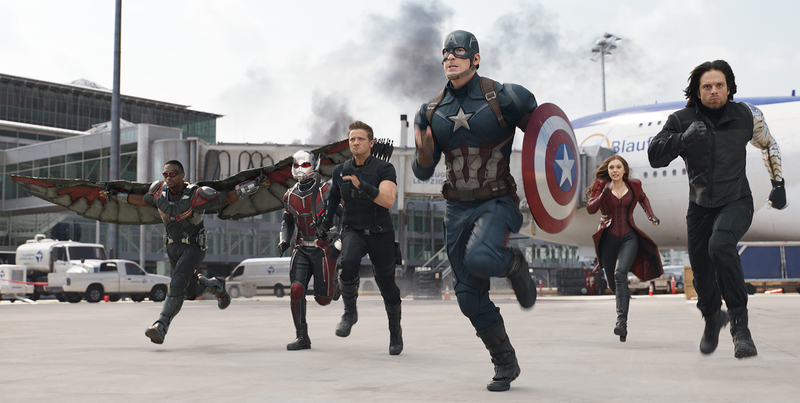 Captain America: Civil War is a big, sprawling superhero mega-movie, with more spandex to the gallon than any flick that’s come down the pike in a long time. The latest in the multi-billion-dollar Marvel cinematic canon, it’s officially the third of the Captain America franchise, but it’s also a continuation of the Avengers movie arc, and it ropes in characters from other Marvel movie properties as well, including Iron Man, Ant-Man (Paul Rudd) and even the new Spider-Man (Tom Holland), whose movie won’t be in theaters until next summer. The “Civil War” in the title refers to the major rift that occurs within the Avengers when a United Nations panel wants to rein them in. The global community is concerned about the civilian deaths and wakes of destruction that accompany the superheroes’ bad-guy smackdowns—a theme that also cropped up a few weeks ago in another comics-character slugfest, Batman v Superman. The Avengers divide into two camps about the issue—those who feel that some international oversight and cooperation is the way to go (led by Iron Man), and the rebels who refuse to sign the accord (team Captain America). That sets the stage for several spats, a couple of subplots, more than two hours of squabbles and one stupendous battle royale in an abandoned airport. 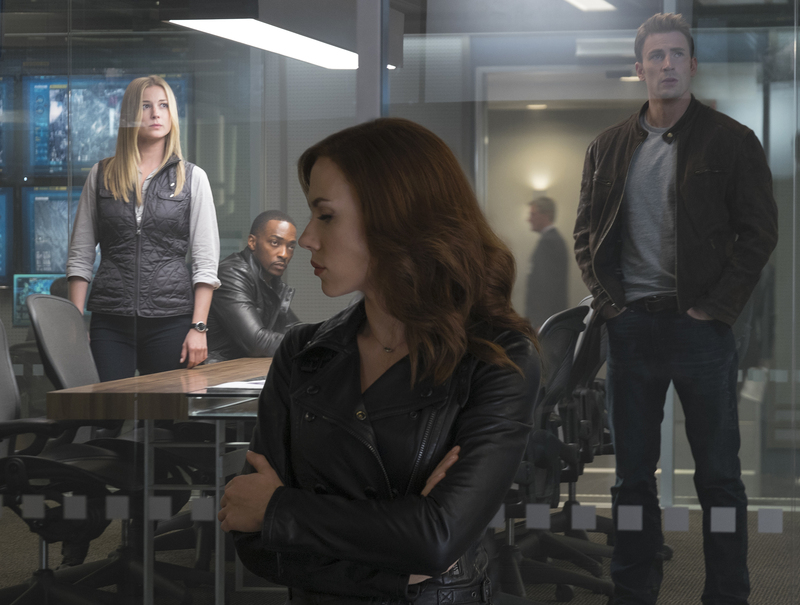 Sharon Carter (Emily VanCamp), Falcon (Anthony Mackie), Black Widow (Scarlett Johansson) and Captain America (Chris Evans) have a serious huddle. Directors Anthony and Joe Russo keep things moving along with style, substance and significant flair, and they give all their characters time to shine—no easy task when they are so many, including newcomers Chadwick Boseman as an African prince who becomes the Black Panther; Marissa Tomei as Peter Parker’s Aunt May; and Daniel Brühl as the Eastern European über-villain Zemo. There’s also Jeremy Renner as Hawkeye, Martin Freeman as a CIA official, Emily Van Camp (from TV’s Revenge) as Sharon Carter, and William Hurt as the U.S. Secretary of State. Oscar-nominated Alfre Woodard pops in as an aggrieved mom. But through it all are the Avengers, the world’s coolest, most powerful cadre of superfriends—family, actually—being ripped apart, fractured from within, pulverizing each other as the divide between them, widened by treachery, becomes filled with distrust, dark secrets and deep wounds from the past. There’s a whole army of frozen Winter Soldiers, a funeral and a sweet kiss between two characters that may point to future romance. How does this wham-bam, jam-packed road trip on the superhero highway end? I won’t spoil it. But you shouldn’t be surprised to know that even when it does, it doesn’t, and that the Marvel movie map is still being drawn for Captain America, Iron Man, Spider-Man and other characters for years to come!